This colorful card game is a creative twist on the familiar game of rummy. Instead of using the traditional numbers and suits, players arrange sets of cards according to how they line up in the spectrum. A handy key is provided for children still learning the color wheel (and adults who need a hint). Suitable for children as young as eight but with plenty of challenge for adult players, it will hone your strategic thinking skills as it brightens your day. For 2 to 6 players. Made in China. Check out more colorful games: Array Game, and Cubu Game. Please note: Spectrix Game has been discontinued. Once it sells out it will no longer be available. Spectrix, in a nutshell: "Spectrix is a quick-moving, easy-to-learn game that gets your mind working in new and different ways. 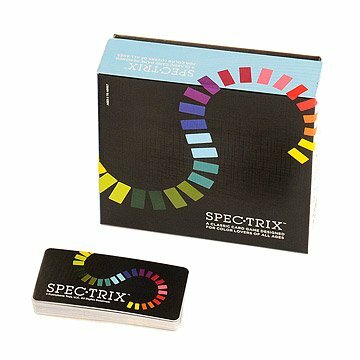 The Spectrix deck contains 96 cards, each of which is a single color on the playing side, with 12 different colors in the deck. Everyone is dealt a hand, and the goal is to be the first player to get rid of all your cards. On your turn, you can place combinations face up on the table consisting of 3 or more cards of the same color or 3 or more cards containing consecutive colors (based on the color spectrum found on a special guide card). You can also use cards by adding to existing combinations on the table. Or, and this is where real skill comes in, you can reorganize any and all of the current cards on the table to form new combinations that help you play cards from your hand. For example, you could break up several sets of matching colors and reorganize them into valid color sequences, or vice versa - whichever helps get the most cards out of your hand. This is where your thinking cap really comes in handy. Your ability to survey the table, to see and weigh the possibilities in your mind, can win you the game. Whether you're dabbling for the sheer fun of it, or on your way to becoming a Spectrix master, Spectrix will keep your mind sharp and engaged, open to a world of possibilities!" --Tillywig Toy, on Spectrix's 2012 Brain Child award. This card game brings a unique, colorful twist to the familiar game of rummy, and offers a fun challenge for both children and adults.